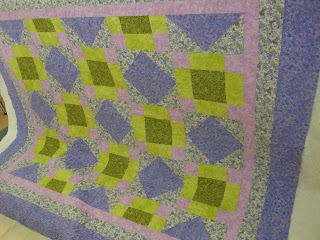 Was going through my photo's and realized I have a lot of customer quilt pics that I haven't shown yet. So grab a beverage, sit back and enjoy! 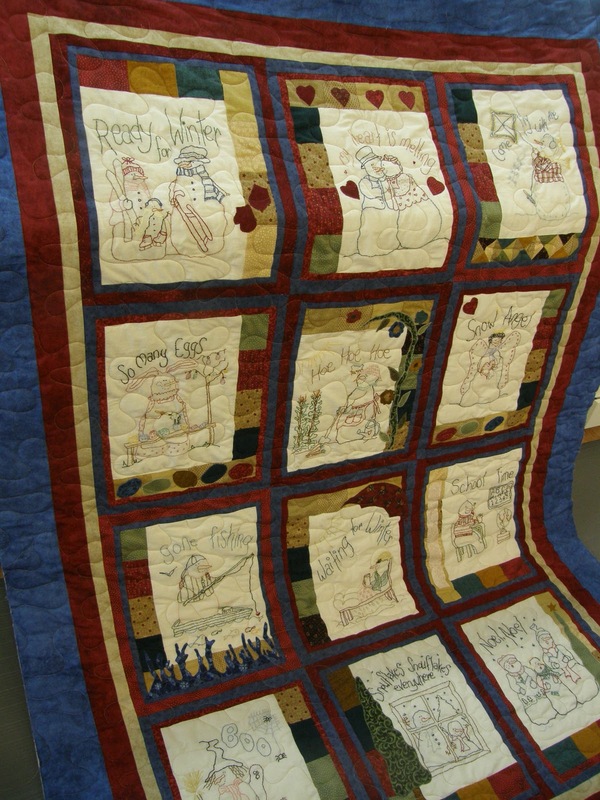 Rose also did this photo quilt for her grand-daughter. Pieced by Shirley. 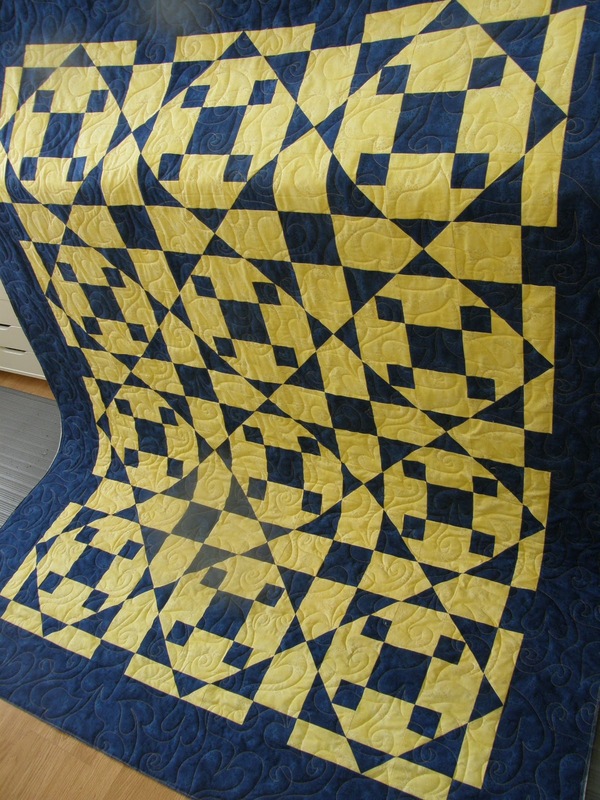 The flattest stack n whack quilt I have ever quilted! 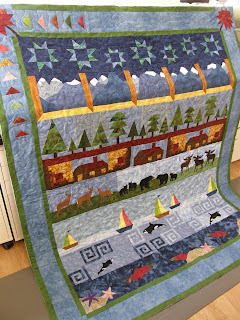 I absolutely love the backing for this quilt. 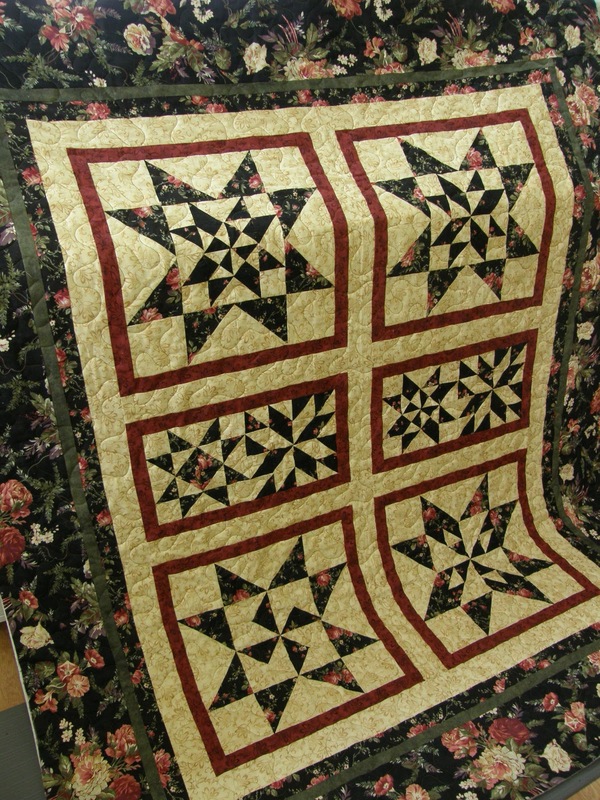 Sadly, I failed in recording the name this customer quilt. And lastly, this beautiful custom quilt by Judy. *whew*! 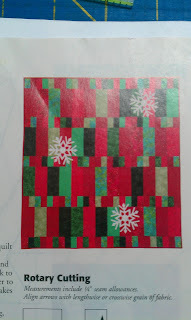 I told you December was a busy quilting month lol! Hope you enjoyed the quilts as much as I enjoyed quilting them. How was everyone's Christmas? We had a great holiday here. As busy as it can be, I do love it all. The family get togethers, the dinner parties, the food, it's all fun! But now all the out of town guests are gone, the leftovers are mostly eaten and it's time to relax for a few days before the hustle and bustle of work and school take over again. Yesterday I finally got reacquainted with my sewing machine; oh how I have missed it. And the fun we had! 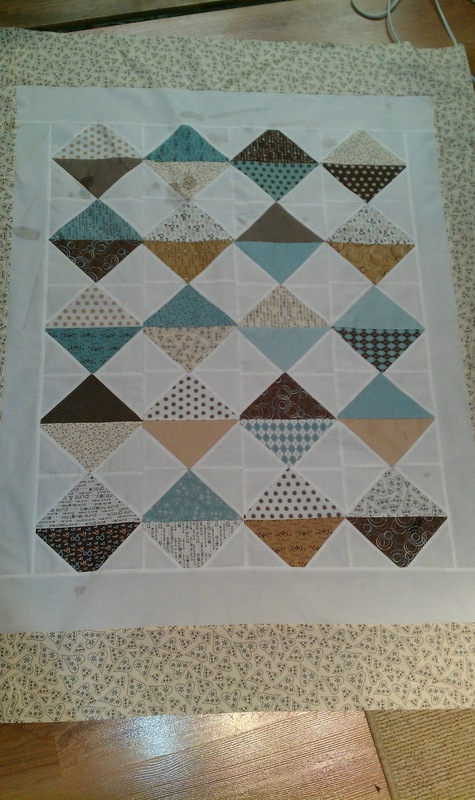 I finally got the borders on this baby quilt. It's been finished since July and just sat waiting and waiting for the border. Now it's finally finished and all in good time as we had a new little one enter our family just before Christmas. 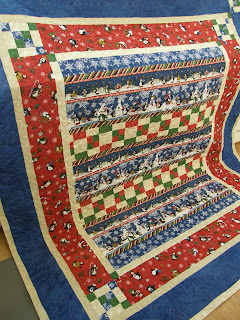 Never up, mom's Christmas present that I gave up on getting completed before Christmas. 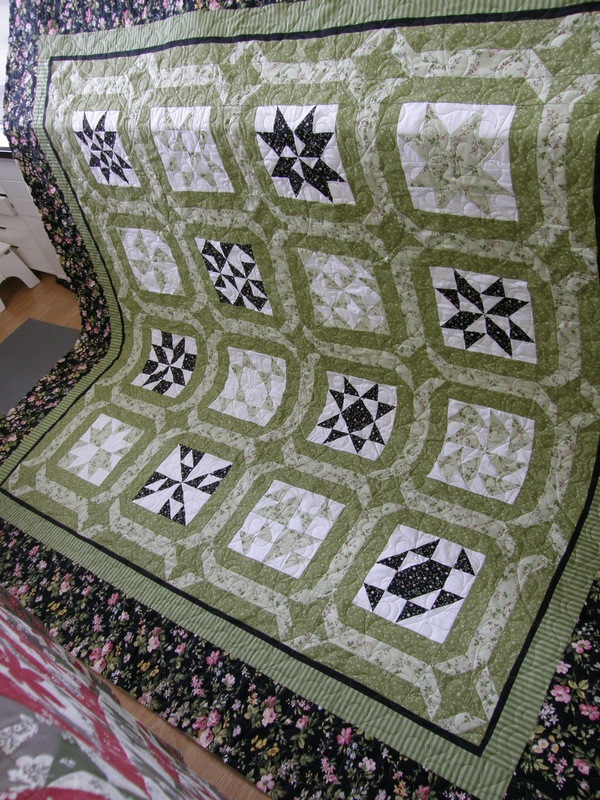 The pattern called for the quilt to be in reds and greens. 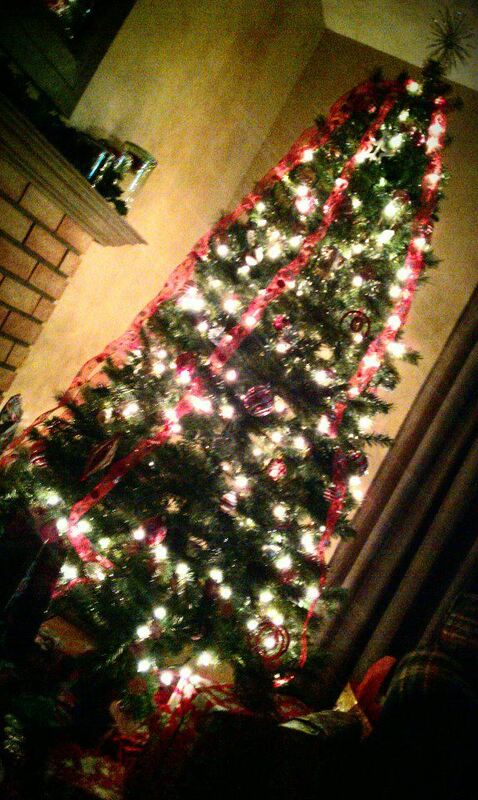 Mom is not a red and green person; regardless if it is Christmas. I thought if I pieced it in her colors(I raided her batik fabrics to make the quilt); I could still pull it off. 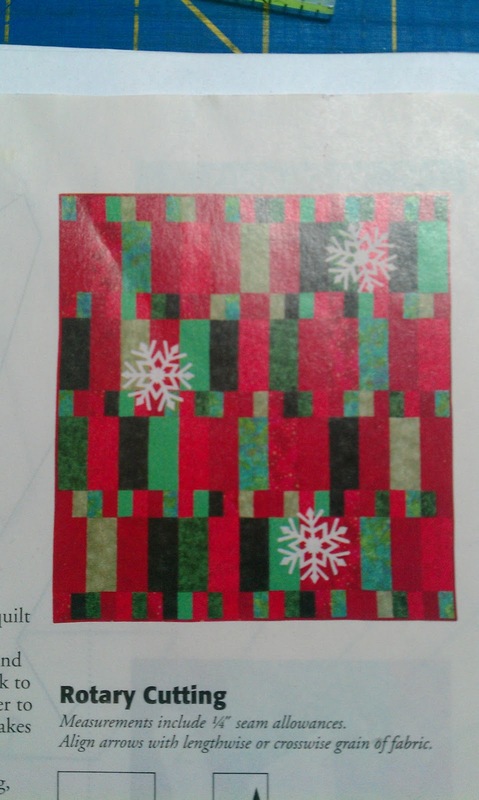 I tried mom's quilt with the snowflakes and it just doesn't work. 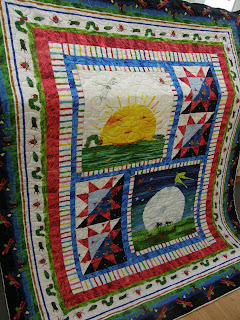 And I love the quilt without so it is done. Now how to quilt it. Any ideas? 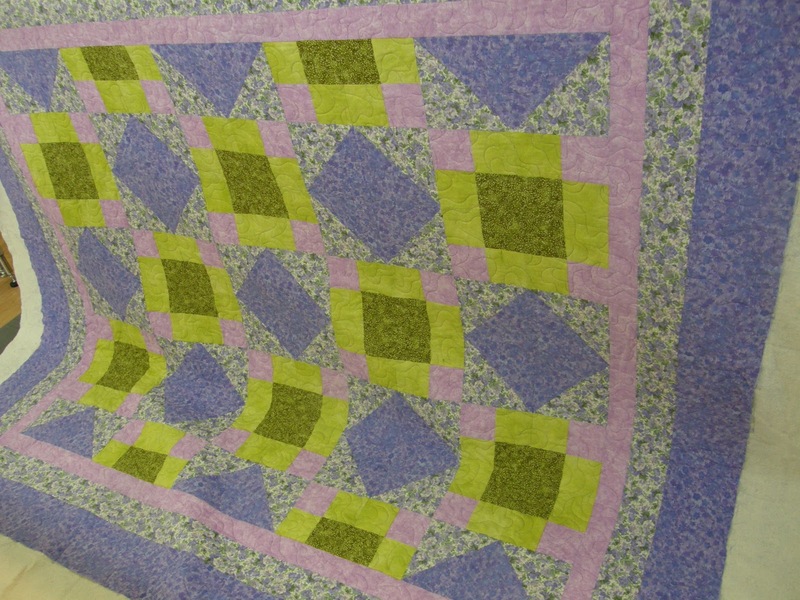 Next up, Dad's quilt. 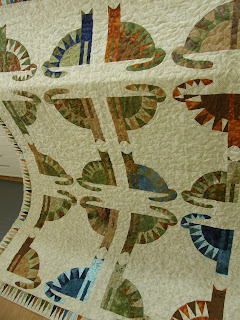 The idea of this quilt came about 3yrs ago. I had the fabric all shoved into a plastic bag in my quilt kit bin and each birthday and Christmas since, I have said I would finish(start lol) the quilt. This was the year! 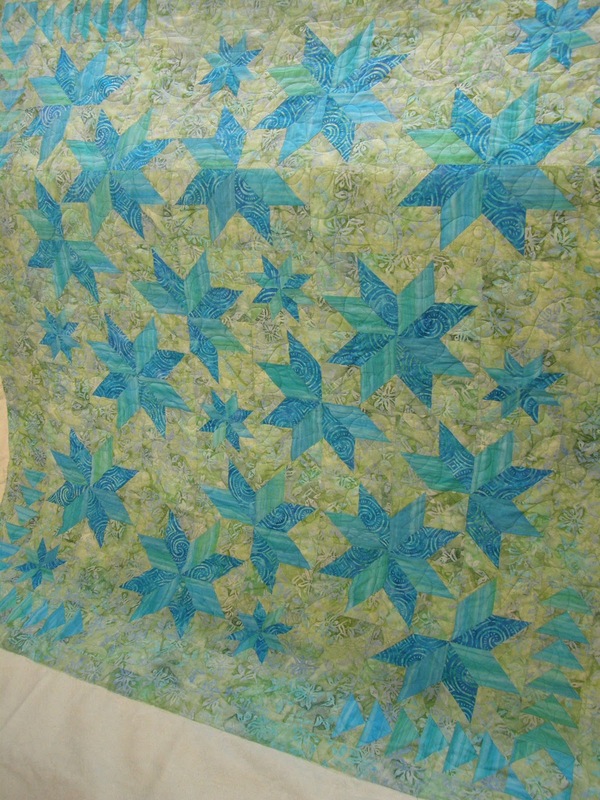 Sadly, I used the main focal fabric in a different project and I didn't have the pattern anymore so I sort of winged it. 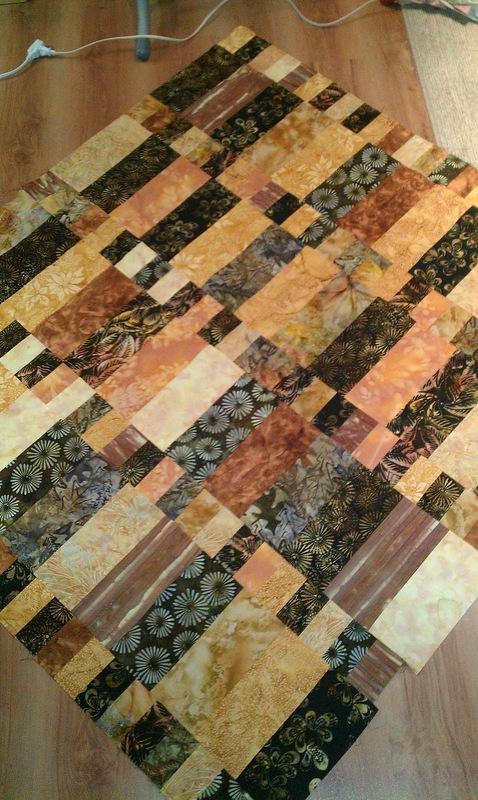 I had the quilt together, was sewing the final border on it last night when I realized, I could make it a wall banner so I ripped it apart, turned some blocks around and now we have this. Can't wait to get this quilt so Dad can hang it in his music room. I traced out some Santa wallhangings that I was planning as giving as gifts. I completed 2, the other 3 were just traced. I got those finished up; now just to blanket stitch them. Aren't they cute? Here's one of the finished ones. Lastly, a winter wallhanging for work . 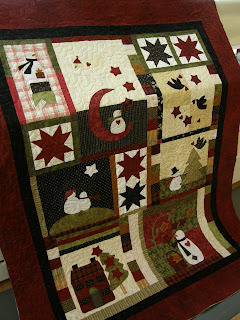 He's been cut out since the beginning of December and now all ready to be quilted. And we can finally take the autumn wallhanging down lol! Whew that was a long blog post! Enjoy the rest of the holidays, see you next year! I won't be around much next week; planning on spending it relaxing with friends and family. We wish you joy and happiness this holiday season. The colors are perfect for Andrea's house. I used a different shaped wreath this time and I love how it looks so full and dimensional. These make such great gifts. I had a wee little accident yesterday involving my travel mug of tea and my sister in law's quilt. 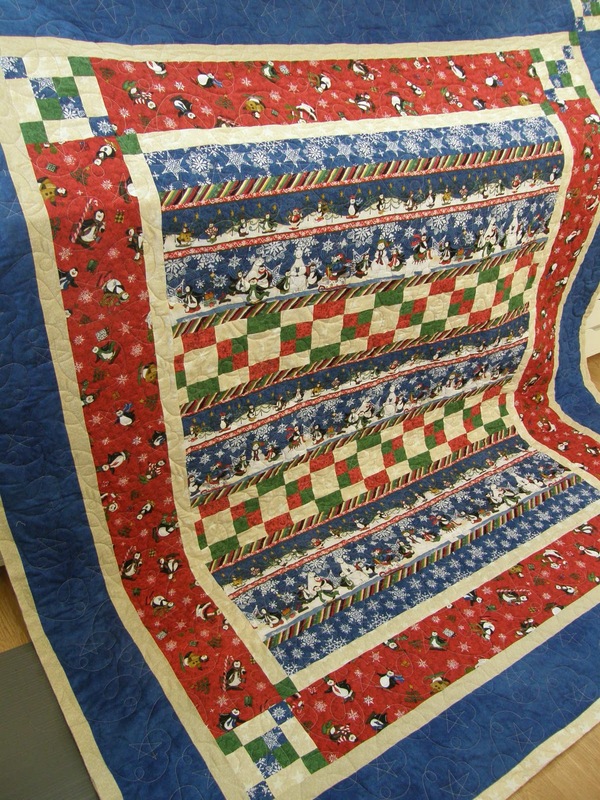 Should I mention that the quilt is white? *sigh*. A few treatments of Grandma's Secret Spot Remover didn't work. Bleach didn't work. So I abandoned the quilt and went to my back-up plan. 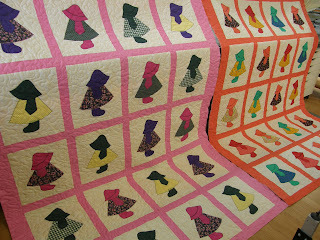 I was going to finish this quilt originally for Erica because I didn't think I would have the white one done. 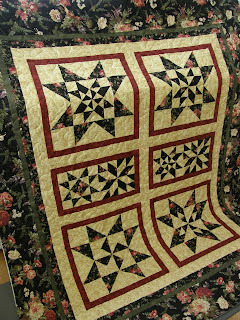 But I got the back-up plan quilted(bound it last night and popped it in the mail this morning) and mom surprised me with the news that she got the tea stain out of Erica's original quilt so I will get that finished up and mailed off to her in the new year. Yay for moms! In the end it all worked out. 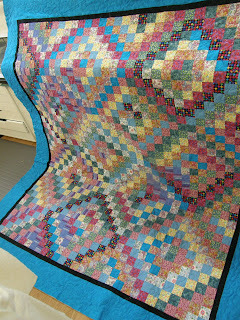 I got a phone call from Hamels yesterday; they had one more quilt, could I possibly get it done? The pattern is a Coach House Designs pattern. 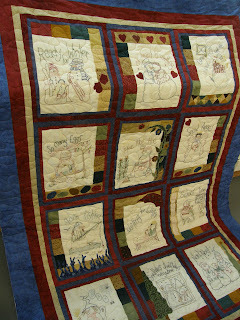 Barb has a book coming out in the Spring; mom and I quilted all the quilts in her book. 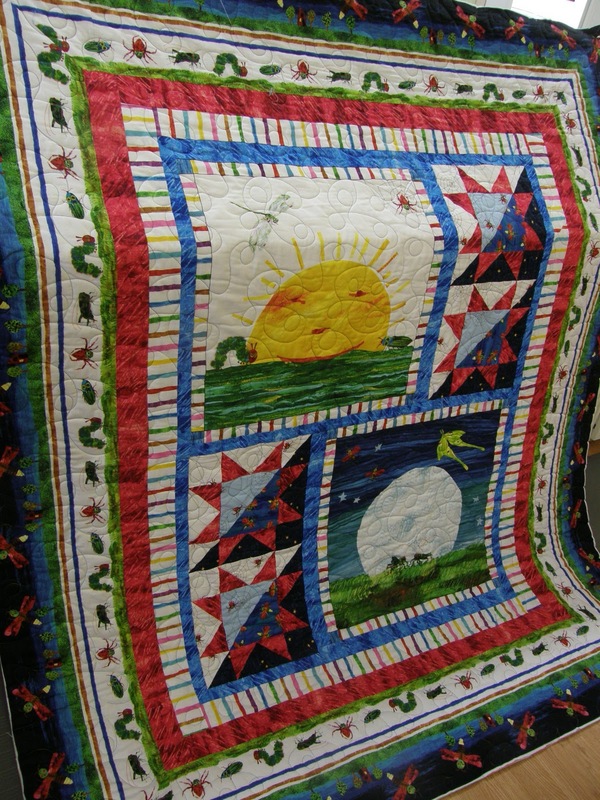 One of the quilts I did was chosen to be on the book cover; so exciting! Christmas holidays; love them! We all slept in this morning; except for Jim. He's working until Wednesday than off the rest of the year. 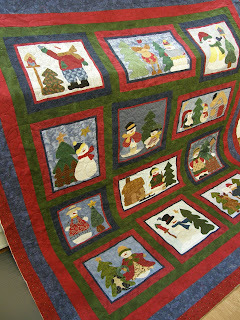 I finished 2 Christmas presents off last night and am heading over to work today to quilt the third. I'll have to show you a sneak peek before it gets mailed off tomorrow. Here are the teacher gifts for this year. 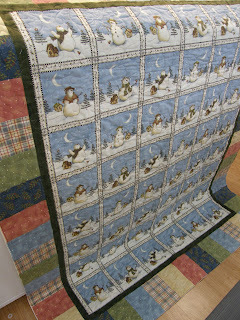 Smaller than I had expected but that was good since it took no time at all to get these cuties appliqued and quilted up. 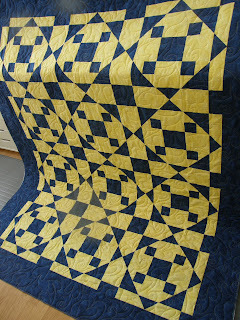 I got the last two customer quilts done this afternoon and that wraps my year of quilting-woo hoo! I am shocked I got them all done and on time even! To celebrate, a friend and I made these little cuties this afternoon. I love how it ties into my new Christmas colors this year. don't take a picture on the piano when someone is playing the piano. 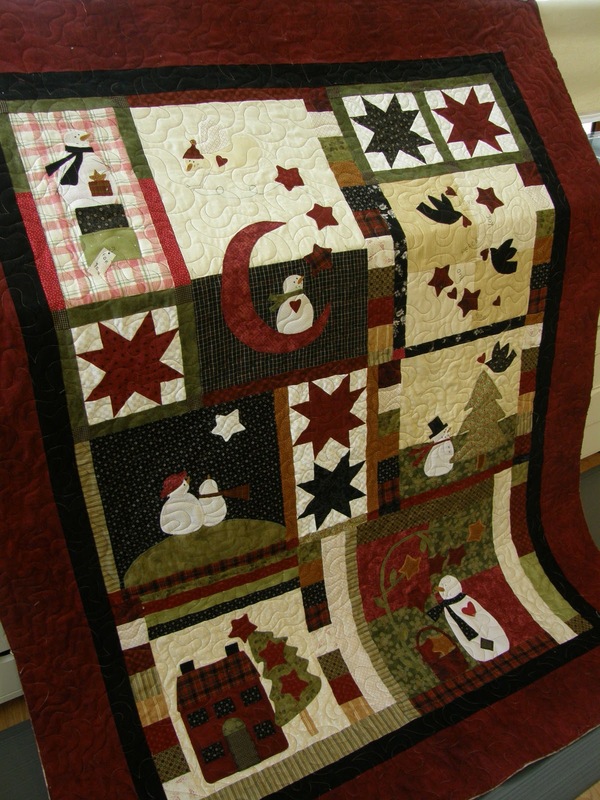 I was hoping to have a new Winter quilt finished to show you today but I spent the weekend doing our Christmas cards(they are DONE!) so not a lot of sewing time. I did sneak in some time Saturday evening but that isn't finished yet either lol. 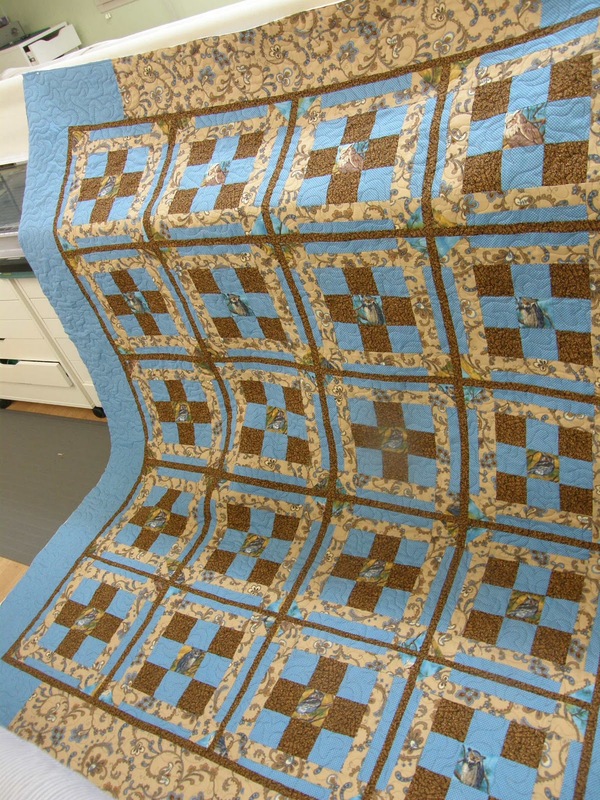 So another table runner to show you. I have two more in the works then I am finished with my table runner craze. At least I am hoping to be finished with them! I just realized that I never got a picture of the runner all laid out. Sorry! It's a disappearing 9 patch using a charm square pack of Grace. Love that line! Today is the start of my last week at work for the year. And a long week it will be. If all goes well, knock on wood, I'll be finished all the quilts right on time for Friday. Than it's time to enjoy some time off!